if i want to add more Smiley image, how can i do.? @pisey: add your smiley’s images to your project and extend the regex for handling smiley code. ur code doesn’t handle new lines very well (repro: typing http://google.com into the chat box then setting the cursor before the h and pressing enter, http://i.imgur.com/c7xd1kV.png), is there any solution to this? @mike: The error happens in block code for handling the URL. Remove the Replace(Environment.NewLine,””) in foreach line. However to get URL parsed you still need a space at the end. 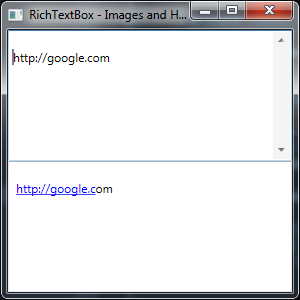 For example to get “http://google.com” parsed, you have to enter “http://google.com ” to tell that URL already ended.